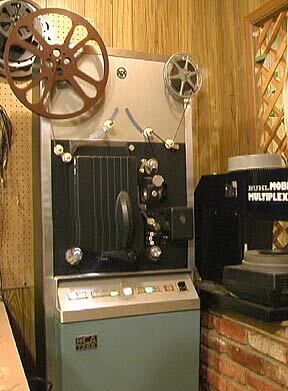 16mm began as a medium for home movies in 1923 after Eastman Kodak spent many years working on a system of movie equipment and film that would be easy enough for the advanced amateur photographer to use, yet reasonably affordable. This effort resulted in the advent of the Sixteen Millimeter "Cine Kodak" Camera and the "Kodascope Projector". In later years a sound track was added on one side of the film, sacrificing one row of perforations. 16 mm film was the format of choice for amateurs with means until the advent of the "Kodak Cine 8" in 1932. 16mm film is transferred to a variety of mediums at Integrated Imaging. We use RCA TP-66 projectors set to run at 24 frames per second. This puts each movie frame on 2 then 3 video fields (3-2 pull down). For speeds of 12, 16, and 18 frames per second, we use frame interpolation to correct the frame rate, this technique adds full frames so does not reduce the video quality. These projectors weigh about 500 pounds and have a rock solid picture for an excellent video transfer. The film is projected into a multiplexer which provides an aerial transfer, meaning the image is projected to a plane in mid air so there is no screen to rob light and color saturation. Our 3 chip digital transfer cameras are then setup to record the aerial image by focusing the lens on the same aerial plane as the projector. This is a tricky optical setup that is well worth the effort as a bright, colorful, and sharp image is the result. The resulting video signal is sent via "firewire" (at 525 lines of horizontal resolution) to either the transfer computer for DVD or when editing is required, or to a MiniDV recorder. At the same time s-video signals (400 lines of horizontal resolution) are sent to professional SVHS editing decks for SVHS and VHS transfers, and to Hi8 Decks for Hi8 and Video8 transfers. The video signals are monitored at all times to insure the highest quality video that each device and format is capable of recording. Any audio on the 16mm film either optical or magnetic is transferred at the same time and monitored for proper signal strength. I can't thank you enough for the excellent service that you and your team have given us on this project. The final product looks great. Rest assured that I will not hesitate to recommend you to anyone seeking such a professional service.